Before Christmas, I had been tweetering about my lack of grace when it came to baking. I was on the look out for simple, fool-proof recipes that might help build up my confidence when it came to cakes. 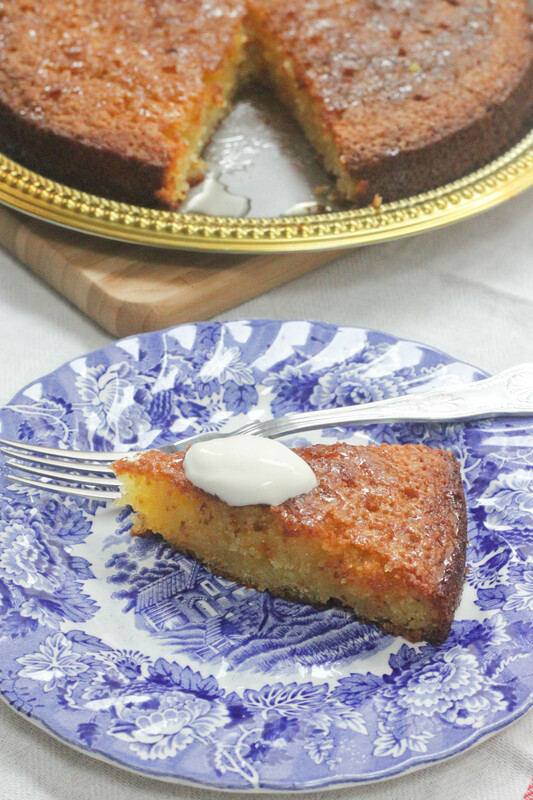 Sinead Ryan (@sineadryan) came to my assistance by emailing me her tried and tested recipe for a Tunisian Almond and Orange cake. She had made it for many a dinner guest and promised that it always turned out delectable. I have since made this cake about seven times, and each time it has turned out without a snag and barely a pearl of sweat sweeping my brow. 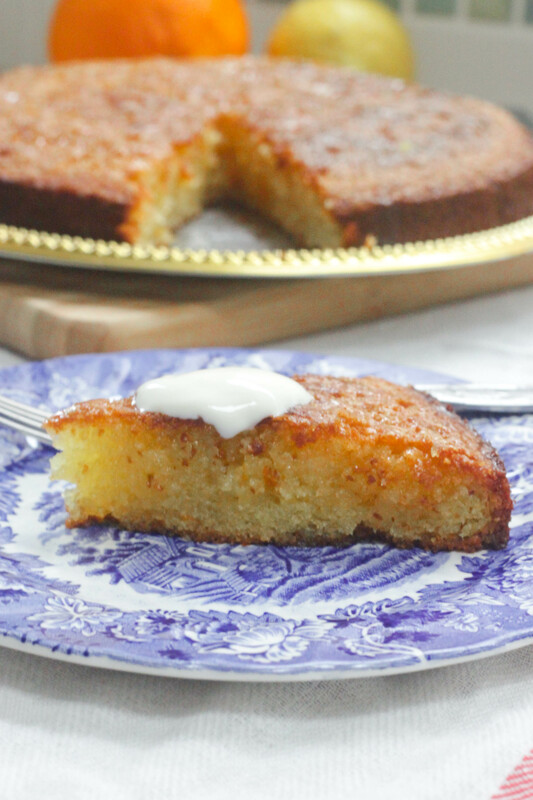 It’s a very straight-forward and simple cake, with a devastatingly sweet yet easy-to-make citrus syrup to drizzle over the top. It genuinely tastes better the day after baking which makes it extra brilliant if you’re cooking for a crowd and want to get the dessert well out of the way! Start by pre-heating your oven to 190C/170C fan/Gas Mark 5. 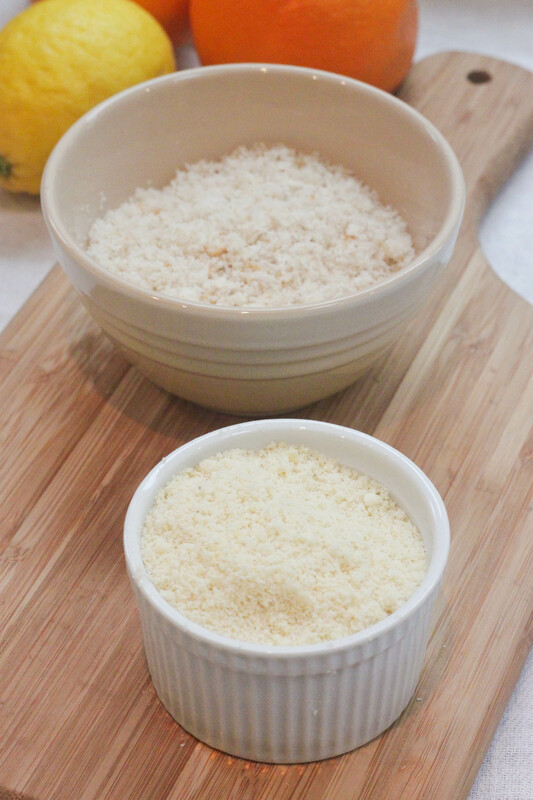 In a large bowl, mix together the breadcrumbs, caster sugar, ground almonds and baking powder. 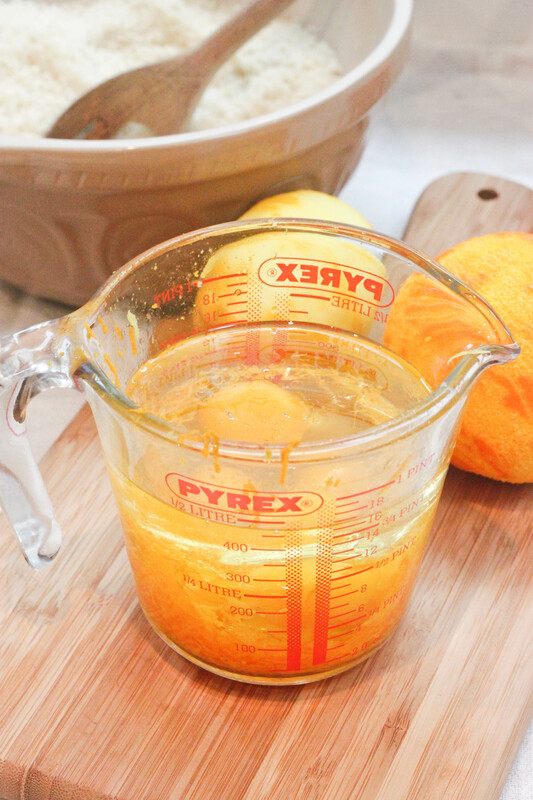 In a measuring jug, mix together 200ml of vegetable oil, 4 large eggs and the orange and lemon zests. 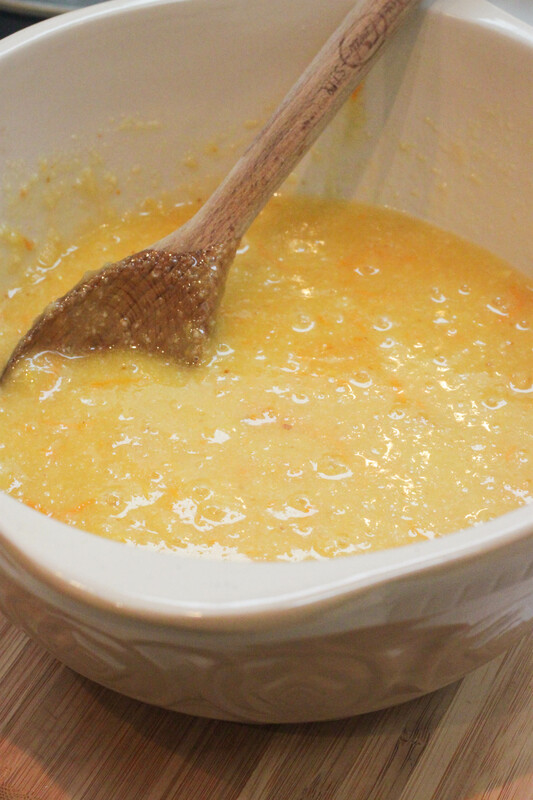 Using a wooden spoon or spatula, fold the wet egg mixture into the dry ingredients until well blended. You will have a really wet and sloppy mix. Grease a 23cm springform cake tin with a bit of butter. 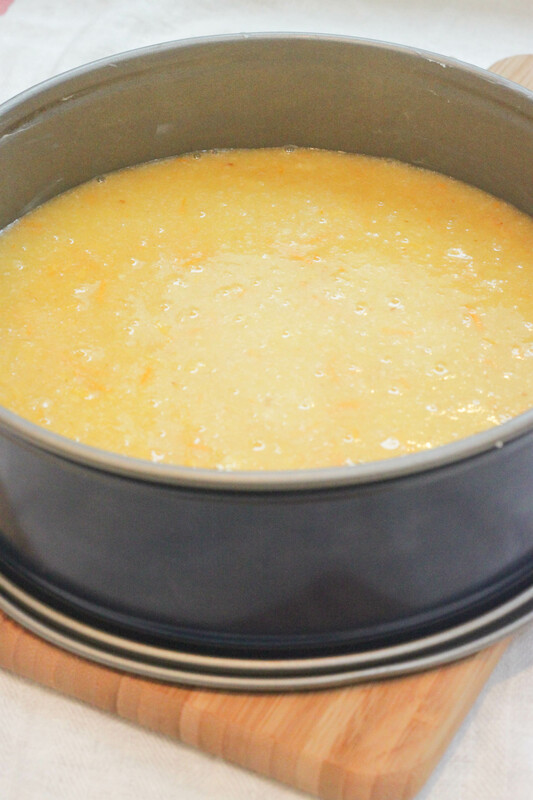 Pour the mixture into the cake tin and put into the oven. Bake for 30 to 35 minutes, until a skewer placed into the centre comes out clean. It will be a little oily but that’s good. Allow the cake to cool in its tin. Once cooled, transfer it to a deep-ish plate so that your syrup will be able to collect around the cake. Before serving, make your syrup. 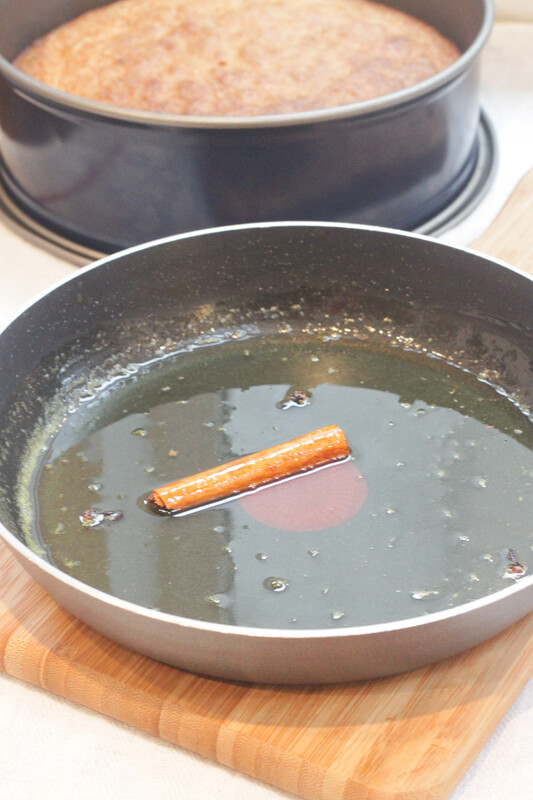 Put the caster sugar, lemon and orange juices, cloves and cinnamon stick in a small frying pan. 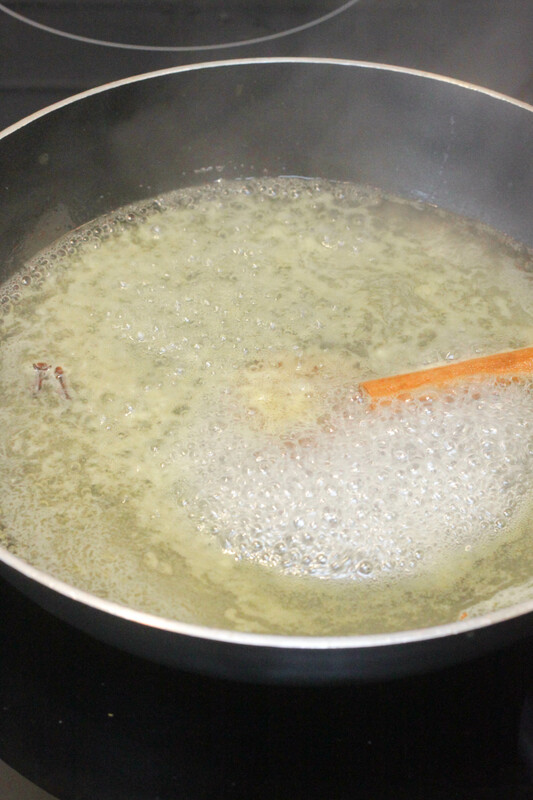 Bring it to the boil and simmer, stirring constantly, for three minutes. Allow it to cool slightly and you’ll see it’ll be lovely and syrupy. Using a skewer, poke lots of little holes all over your cake. Now pour the syrup all over the cake, making sure to evenly soak the whole thing. Serve warm with a dollop of creme fraiche on the side. Simple! If you’re making a slightly Moroccan or Middle Eastern themed dinner, there couldn’t be a better end to it than this cake. Such a wonderfully simple yet rewarding cake recipe. Thanks again, Sinéad! Here’s a clip of Tunisian violinist and viola d’amore player Jasser Haj Youssef performing La Médina. It’s not the best quality – a man walks past the screen at one point – but it’s pretty evocative of that fascinating part of the world. For someone who is rubbish at cake making, it sounds as though even I could do this one. Off to get an orange tomorrow. It’s brilliantly simple, Carol. Although you can’t tell that by the taste of it. A super cake recipe, especially for beginners like you and I! Aoife, this sounds like a really delicious cake. I’m always on the search of tasty cakes that don’t really require a frosting. I’m going to give this a go this week! Do give it a go, Nessa! It’s lovely and simple. And very sweet so I’m sure the kids will love it! I am definately on this one. Looks amazing! It’s a good one all right, hope you enjoy it! That sounds like a great menu! Definitely give this cake a go, it’s such a winner. Sinead made this for me…. it is flippin AWESOME!!! Lucky you! I make this cake a lot, it’s a winner. educational and you really are obviously extremely well-informed of this type. notable and strong written content. I’ve seen so many comments on this that I couldn’t be more perplexed. was doing a little research on this. And he in fact ordered me breakfast due to the fact that I found it for him. I’ve just taken my orange cake out of the oven and its turned out green, with a very oily and eggy taste.I followed the receipe, where did I go wrong? I made this cake and it came out okay but, I thought it was greasy. Could 200mls of oil be right?? Would it be okay to use less oil? I read another similar recipe and I saw it only had 100 grams of butter in it. for his site, for the reason that here every information is quality based material. I make this too. It is just fabulous! I Can Has Cook? – Irish Food Blogger. And I do have a couple of questions for you if it’s allright. And, if you are posting at additional online social sites, I would like tto keep up with everything fresh you have to post. Would you make a list of every one of alll your community pages like your linkeedin profile, Facebook page or teitter feed? of sense. But, what about this? what if you added a little content? however suppose you added a title to possibly get folk’s attention? 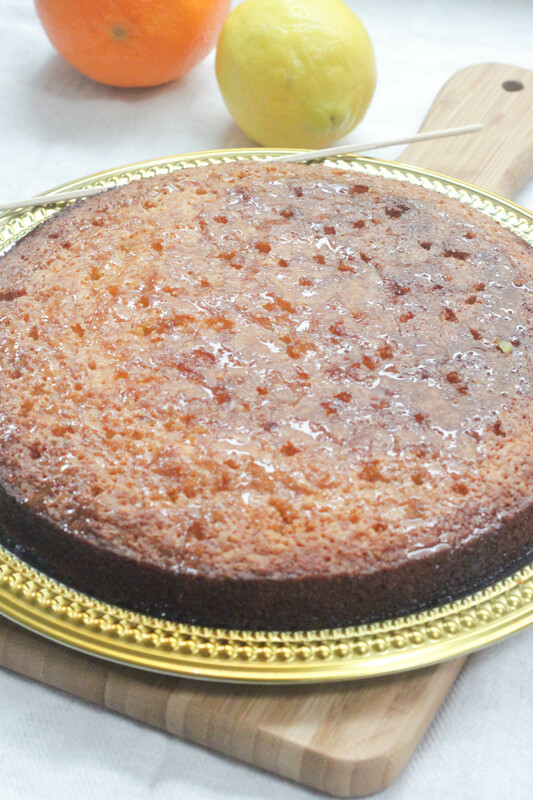 I mean Sinead’s Tunisian Almond and Orange Cake – I Can Has Cook? add a related video or a related picture or two to grab people excited about everything’ve got to say. all my friends, for the reason that if loke to read it afterward my contacts wiill too. motor will blend soups, smoothies, milkshakes, foods, sauces, and any other food or drink that needs pureed. powders. There is probably a build-up of food slowing the blades. the food processor and hopefully there are others around to do that job. island flavor to the locals while incorporating a touch of the familiar. Finding a quieter noised blender will cost more money. coffee, create peanut butter and so much more. your food preparation and cooking. ceiling) is installed as per manufacturers instructions, there will be approximately a. The consumers who tried the product said that it is pain free and affordable. Patients with light skin and dark hair would benefit the most from laser hair removal. hair. Unless you’re a festival contortionist or Stretch Armstrong, shaving your own back provides some severe overall flexibility issues. The product is known to deliver great and longer lasting results. as good as it is made out to be. Stop blow drying hair at the moment to dry their hair. that provides, as the FDA likes to say, permanent hair reduction.